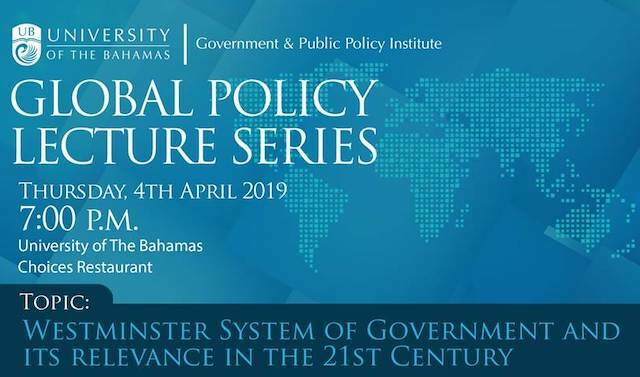 The Government & Public Policy Institute at the University of the Bahamas (UB) presents Professor Peter Boettke in their Global Policy Lecture Series, Thursday, April 4, 2019 at 7:00pm, at Choices Restaurant, UB. Westminster System of Government and Its Relevance In The 21st Century. Peter J. Boettke is a University Professor of Economics and Philosophy at George Mason University, as well as the Vice President of Advanced Study, Director of the F. A. Hayek Program for Advanced Study in Philosophy, Politics, and Economics, and BB&T Professor for the Study of Capitalism at the Mercatus Center at George Mason University. Through an analytical framework strongly influenced by the paradigm of Austrian economics, as well as other intellectual traditions personified by thinkers in the mainline of economic thought—such as Adam Smith, F. A. Hayek, James M. Buchanan and Elinor Ostrom—Boettke has developed a robust political economy research program that expands an understanding of how individuals acting through the extended market order can promote freedom and prosperity for society, and how the institutional arrangements shape, reinforce, or inhibit the individual choices that lead to sustained economic development. Before joining the faculty at George Mason University in 1998, Boettke taught at New York University. In addition, Boettke was a National Fellow at the Hoover Institution for War, Revolution and Peace at Stanford University during the 1992-1993 academic years and the F. A. Hayek Fellow in 2004 and 2006 at the London School of Economics as well as a visiting professor or scholar at the Russian Academy of Sciences in Moscow, the Max Planck Institute for Research into Economic Systems in Jena, Germany, the Stockholm School of Economics, Central European University in Prague, and the Charles University in Prague. In March 2011, Boettke was a Fulbright Fellow at the University of Economics in Prague, Czech Republic. Boettke has served as the President of the Southern Economic Association from 2015-2017, the Mont Pelerin Society from 2016-2018, the Association of Private Enterprise Education from 2013-2014, and the Society for the Development of Austrian Economics from 1999-2001. In 2013, he became a Founding Honorary President and Honorary President for the World Interdisciplinary Network for Institutional Research. 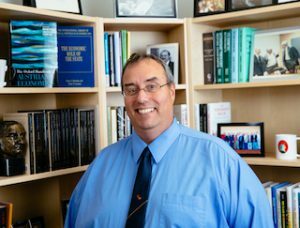 At George Mason University, Boettke directs the weekly Philosophy, Politics and Economics (PPE) Workshop, which was established to encourage and explore the latest research at the intersection of these three disciplines by scholars from across the social sciences and humanities. Boettke is an affiliated faculty member in Mason’s Russian Studies Program, has taught at the Mason Antonin Scalia Law School, and has served on dissertation committees in the School of Public Policy. He has also taught in the Honors College Programs at Oakland University, New York University, and George Mason University. As a teacher, Boettke is dedicated to cultivating enthusiasm for the economic way of thinking and the importance of economic ideas in future generations of scholars and citizens. He is the co-author, along with David Prychitko, of the classic principles of economics texts of Paul Heyne’s The Economic Way of Thinking (13th Edition, 2013, Pearson; formerly with Prentice Hall). His efforts in the classroom have earned him a number of distinctions including the Golden Dozen Award for Excellence in Teaching from the College of Arts and Sciences at New York University and the Mason Alumni Association’s 2009 Faculty Member of the Year award. In 2005, Boettke received the Charles Koch Distinguished Alumnus award from the Institute for Humane Studies at George Mason University and the Jack Kennedy Award for Alumni Achievement from Grove City College. Boettke was the 2010 recipient of the Association of Private Enterprise Education’s Adam Smith Award as well as Mason’s College of Humanities and Social Sciences Distinguished Alumnus of the Year Award. In 2012 and 2013 respectively, Boettke received a doctorate honoris causa in Social Sciences from Universidad Francisco Marroquin and Alexandru Ioan Cuza University. Outside of the classroom, Boettke has pursued a parallel career in athletics. A former high school and college basketball and tennis player, Boettke first worked as a tennis teaching professional before pursuing his graduate degree in economics. After graduate school, he began coaching youth basketball and eventually coached at the high school and elite AAU level. Several of his former players went on to compete in college. In 2009, he was inducted as a coach into the local basketball hall of fame in Northern Virginia.